Abstract: One indicator for efficient management in a port is the time spent by a ship in the port quays. The time allowed for loading-unloading into a specialized quay is mentioned in the management contract. Because the cost of the overtime is very high, it is very important to have a special plan to unload the container ship in a short time. Given the number of containers to be unloaded from a vessel and the initial state (in regards of number of slots) of a block, the genetic algorithm that we propose in this paper finds the plan of container stacking in the block, whilst the objective function is to minimize summation of handling time of yard crane in placing the containers in the available storage cells of the stacking area. The performance of the proposed method is evaluated through several sets of tests on control parameters of the algorithm. One of the objectives of an efficient management plan in a port is to reduce the berthing time of vessels. The port efficiency is determined by the main container terminal operations, namely the vessel berthing operation, (quay or yard) crane unloading/loading operations and container shifting and storage operations. In order to develop better operational strategies and investment plans, researches identified several optimization problems along the years and developed different tools based on intelligent techniques in order to achieve optimal solutions (Figure 1). The Container Stacking Problem(CSP) consists in relocating the containers to ensure easy access to them so that the yard cranes don’t have to do further reshuffles at the expected time of transfer (e.g. , ). The CSP is classified as a three dimensional bin packing problem in , and a genetic algorithm is proposed to solve it. 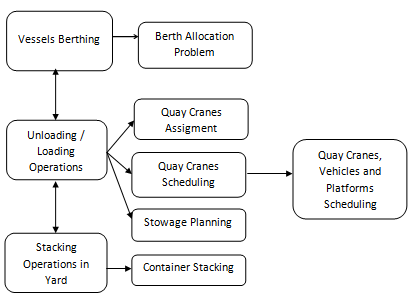 The Berth Allocation Problem (BAP) and the Quay Crane Assignment Problem (QCAP) refer to the allocation of docks and quay cranes to incoming vessels under several constraints and priorities (see , where the CSP, BAP and QCAP problems are considered and a computer-based decision support system that integrates the solution of the three problems is provided). respecting certain constraints (a feasible solution to this problem is found in  using a probabilistic technique inspired from ants behaviour). An extension of QCSP is the Integrated Quay Cranes, Vehicles and Platforms Scheduling Problem (IQCVPSP) considered in a split-platform automated storage/retrieval system (see , where a genetic algorithm is proposed to solve it). In this paper we consider a Stowage Planning Problem which occurs during the unloading task of a vessel. In this respect, a genetic algorithm is proposed and optimal solutions for this problem are found in relatively low computational time. Section 2 gives the main features of the problem considered. In Section 3 we briefly describe the basic principles of genetic algorithms, then we thoroughly depict the one that we proposed. This section also states the results of the several tests that we have been executed on the control parameters of the proposed genetic algorithm. Conclusion remarks and recommendations for further research directions are presented in Section 4. BARBULESCU, A., E. BAUTU, Alternative Models in Precipitation Analysis, St. Univ. Ovidius Constanta, Ser. Mat., ISSN 1224-1784, 17(3), 2009, pp. 45-68. EL-SEHIEMY, R. A., M. A. EL-HOSSEINI, A. E. HASSANIEN, Multiobjective Real-Coded Genetic Algorithm for Economic/Environmental Dispatch Problem, Studies in Informatics and Control, ISSN 1220-1766, vol. 22(2), 2014, pp. 113-122. GHEITH, M. S., A. B. EL-TAWIL, N. A. HARRAZ, A Proposed Heuristic for Solving the Container Pre-marshalling Problem, In the 19th International Conference on Industrial Engineering and Engineering Management, edited by Ershi Qi, Jiang Shen and Runliang Dou, Springer Berlin Heidelberg, 2013, pp. 955-964. HAUPT, R. L., S. E. HAUPT, Practical Genetic Algorithms, John Wiley & Sons, Inc. New York, NY, USA, 1998. 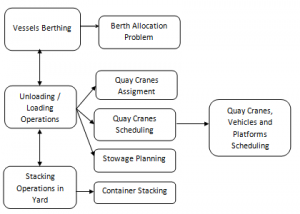 HOMAYOUNI, S. M., S. H. TANG, O. MOTLAGH, A Genetic Algorithm for Optimization of Integrated Scheduling of Cranes, Vehicles, and Storage Platforms at Automated Container Terminals, Journal of Computational and Applied Mathematics vol. 270, 2014, pp. 545-556. KAMMARTI, R., I. AYACHI, M. KSOURI, P. BORNE, Evolutionary Approach for the Containers Bin-Packing Problem, Studies in Informatics and Control, ISSN 1220-1766, vol. 18(4), 2009, pp. 315-324. LAGOS, C., B. CRAWFORD, R. SOTO, J. M. RUBIO, E. CABRERA, F. PARADES, Combining Tabu Search and Genetic Algorithms to Solve the Capacitated Multicommodity Network Flow Problem, Studies in Informatics and Control, ISSN 1220-1766, vol. 23(3), 2014, pp. 265-276. LAJJAMA, A., M. EL MEROUANI, Y. TABAA, A. MEDOURI, A New Approach for Sequencing Loading and Unloading Operations in the Seaside Area of a Container Terminal, International Journal of Supply and Operations Management, vol. 1(3), 2014, pp. 328-346. NOROUZI, A., F. S. BABAMIR, A. H. ZAIM, An Interactive Genetic Algorithm for Mobile Sensor Networks, Studies in Informatics and Control, ISSN 1220-1766, vol. 22(2), 2013, pp. 213-218. SALIDO, M. A., O. SAPENA, F. BARBER, An Artificial Intelligence Planning tool for the Container Stacking Problem, In Proceedings of the 14th IEEE International Conference on Emerging Technologies & Factory Automation, edited by IEEE Press Piscataway, NJ, USA, 22-25 September 2009, pp. 532-535. SALIDO, M. A., M. RODRIGUEZ-MOLINS, F. BARBER, F., A Decision Support System for Managing Combinatorial Problems in Container Terminals, Knowledge-Based Systems, vol. 29, 2012, pp. 63-74. SIVANANDAM, S. N., S. N. DEEPA, Introduction to Genetic Algorithms, Springer Berlin Heidelberg, 2008.